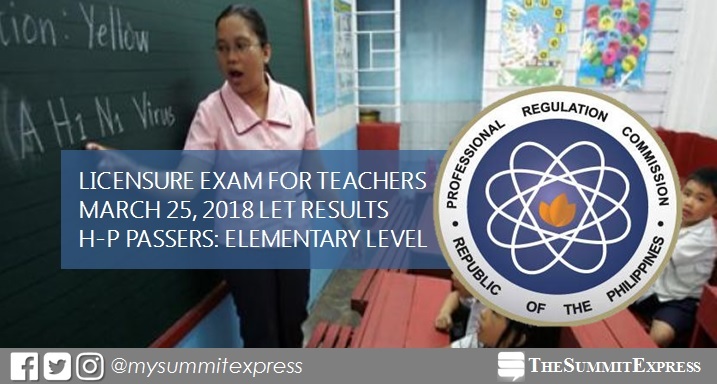 MANILA, Philippines – The Professional Regulation Commission (PRC) officially released on May 23 (Wednesday) the full results, which includes the list of passers of March 2018 Licensure Examination for Teachers (LET). Takers may view on this page the alphabetical roll of passers for H to P Surnames. PRC named new elementary teachers who have successfully hurdled the LET that was administered in several test centers all over the Philippines last March 25, 2018 (Sunday). The Board of Professional Teachers (BPT) who gave the exam is composed of Dr. Rosita L. Navarro, Chairman; Dr. Paz I. Lucido, Dr. Paraluman R. Giron and Dr. Nora M. Uy, Members. In order to pass the March 2018 LET, an examinee must obtain an average rating of not less than 75% and must have no rating lower than 50% in any of the tests. PRC added that passing the LET and having valid professional license are necessary before the practice of teaching profession in the Philippines. Otherwise, those who will violate may face fine and imprisonment based on penal provisions. Note that the projected date of May 21-25 is based on PRC Resolution No. 2017-1068 and updates from some reliable sources. Congratulations to all the passers of LET!